While cleaning out a closet I found a treasure. Old movies of my family that my Dad must have had transcribed from the little 8mm 3 minute films that were popular in the late ’60’s. The movies are grainy and dark but what a treat it is to see and remember Christmases from 55 years ago. My Vardon grandparents in this film are younger than I am now. My Dad in 1959 was younger than my eldest daughter is today. I have a granddaughter as old as I was then. My brother and I were lucky to have both sets of grandparents living fairly close by so we would all get together at one home or another for Christmas, taking turns as to who cooked the turkey. How wonderful it is to hear my mother’s laughter and to see my grandparents images again. All of us having fun. There was always music. One grandmother played the piano, the other the accordion. My Dad and Grandfather played the fiddle. We had a bass drum, flutes and when he got a bit older my brother played the trumpet. I could play the ukulele and the piano (not at the same time). My mother sang and danced. And laughed. 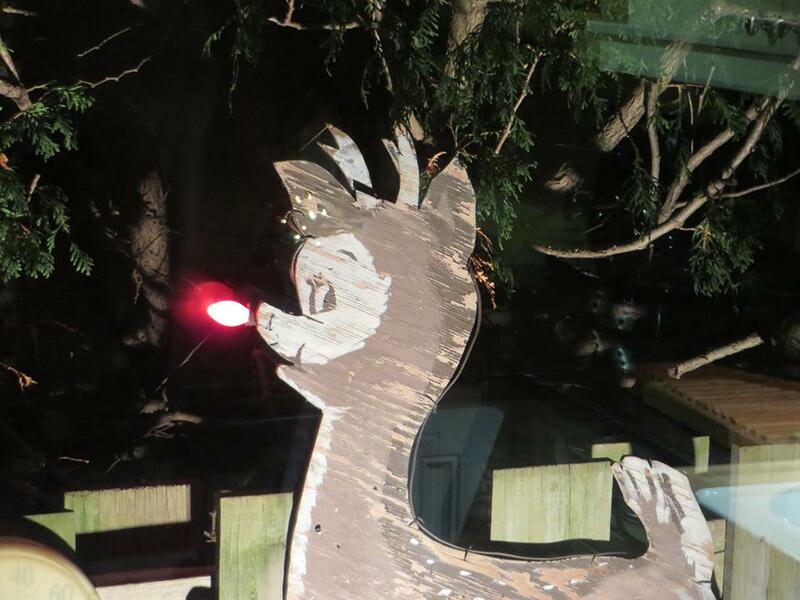 Rudolph as brightened a family yard now for almost 60 years! My Dad had made a plywood Rudolph with a red lightbulb nose that always was strapped to the railing of the front porch. My brother Bob still has that Rudolph and posted a picture last week of it in his Hamilton yard. In 1960 my mom’s cousin and her family came from Montreal to spend Christmas with us. Always fun to get together with “cousins”. In 1960, John F Kennedy was elected President of the U.S., John Diefenbaker was Prime Minister of Canada, Spartacus and Psycho were on at the movies and Elvis Presley and Chubby Checker (The Twist) were at the top of the music charts. A new group formed that year but not yet known to the world was The Beatles. This entry was posted in Uncategorized and tagged christmas, family, memories, music, Ontario by johnageddes. Bookmark the permalink.